It's been a little while since my last post, so here's a cover I recently did for a new comic miniseries published by Boom! studios. 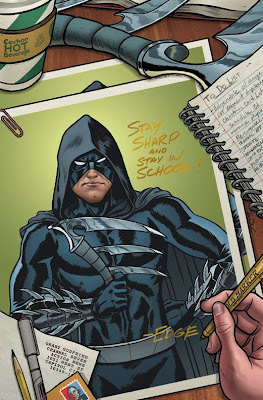 'Caped' will be a four issue mini-series hitting stands in March. It's a bit of a satire, premising that even superheroes need a little assistance from time to time. The story follows a character by the name of 'Jimmy Lohman' as he endures his overbearing superhero boss, 'The Edge', serving as his personal assistant. There's three more covers in the series, which I'll post as the solicits hit. Thought I recognized that guy! Fantastic cover! Can't wait to see this on the stands. Joe, you're a genius...you know that but isn't that character's hand a little out of proportion (not the giant hand holding the pen)? Does it just look odd because of that scythe thing he's holding? The more I look at it the more...argh, ignore me...I'm just being pedantic again...forget I said anything. No, you're right actually. I had noticed this after the pencils stage but my editor liked the small hand better. Alas.